In case you missed it, last week was a nerdgasm of Trekkie race-blogging at The Nerds of Color. There was some truly great writing, and very diverse perspectives on the show(s) we all know and love. In particular, I want to draw your attention to a trilogy I participated in focusing on Deep Space 9 captain Benjamin Sisko. 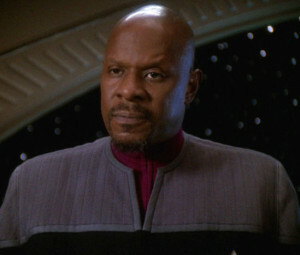 Mostly though, I think I saw my father in Ben Sisko. There exists an unrepentant Black manhood, designed to teach youth from the darker nation how to live in a world designed to benefit others. This is masculinity written in moral absolutes where emotion is what you control to logically consider how best to help your family. Mistakes cost blood; survival demands a “twice as good” perfection that must be trained. Ask Michelle Alexander. Where we’re from, consequences include the nightstick and the chokehold. Jake’s relationship with his father paralleled my relationship with my father: we are not friends. We could be cordial, polite, even friendly. But we are not friends. I don’t know how other families in other cultures handle father-son dynamics, but my father was not my buddy. He wasn’t absentee, nor was he the fun-time guy who played catch to relieve my boredom. My father drove me to band practice in a sweltering August at 14 when I resisted because as a parent, that’s what you do. Feelings are not important. We don’t hang out. He’s my father, and I am a man because he showed me how to be one. But, in contrast to earlier Black characters, Sisko is more than just his fashion sense; he is also often unapologetically (sometimes uncomfortably) Black. For example, in the TOS episode, “The Savage Curtain,” Uhura excuses being called a “charming Negress” because in the 23rd century people have learned not to “fear words.” Sisko, on the other hand, refuses to let racism (implicit or explicit) off the hook. The history of Black people is a painful one. Few rational beings would deny that. Irrespective of whatever box we check off under “race,” most of us acknowledge that Black people have endured great horrors over the expanse of recorded history. Similarly, we are cognizant that the Black experience is still fraught with many hardships today: poverty, mass incarceration, broken families, disassociation from legitimate means of goal attainment, pervasive and ongoing institutional inequality. All of this eventually comes to light in the documentation and summation of historical and present-day accounts of Blackness. But that said, in poking around through such accounts like so many ashes and embers remaining from a once-roaring flame, I ponder: Where to from here? In studying, recording, presenting and interpreting the trials and “tribble-lations” (woot — STAR TREK WEEK!) of Black people and Blackness conceptually, again I ponder: Where to from here? While respectfully acknowledging what Blackness has been and currently is, what are we to say of the future? Who will we (Black people) be? What will we dream? What will we fear? Who (if anyone) will fear us, and conversely who or what will inspire dread within us? What will our relevance be? By and large, answers to such lofty inquiries — even wildly speculative ones — are offered from a scant selection of sources. Thankfully, for Black nerds like myself, there is sci-fi. Sweet, glorious, sci-fi. I had a really fabulous time participating in this trilogy, which culminated in a DS9 marathon this weekend including the truly ground-breaking Season 6 episode “Far Beyond the Stars” (which actually made me cry). I look forward to more great science fiction/fantasy race-blogging at the Nerds of Color in the future. I hope you enjoy the trilogy too!